The North Carolina Courage improved to 11-1-3 with a 3-0 Week 14 win on the road over the Orlando Pride. North Carolina scored all three goals in a blistering three-minute span in the first half, and Orlando could not answer with goals of their own. The Pride thought they had an early lead in the 22nd minute on a Marta corner kick that was knocked into her own net by Courage forward Jessica McDonald, but Pride forward Alex Morgan was whistled for a foul after pushing Courage defender Abby Dahlkemper in the box, and the goal did not stand. Just a few minutes earlier, Pride goalkeeper Ashlyn Harris had shut down a chance by Crystal Dunn with a big save to keep things 0-0. But the Courage found their stride later in the first half. First, Debinha scored in the 37th minute, making a play on the ball after a chip into the box by Dunn. McDonald and Lynn Williams surrounded her in the box, but Debinha took the shot herself. Harris got a hand on the spinning ball, but could not keep it from going over the goal line. The Courage doubled their lead two minutes later off the foot of Merritt Mathias. Denise O’Sullivan intercepted an Ali Krieger pass meant for Rachel Hill and played it across the top of the area to Debinha, who hit it wide to Mathias. The Courage defender was open and cracked a shot from the top of the penalty area that deflected past Harris to make it 2-0. Just a minute later, it was McDonald’s turn. Courage midfielder McCall Zerboni picked off a Monica long ball and played it to O’Sullivan. O’Sullivan then threaded it down the middle to Dunn, who played the pass down the middle to McDonald, running in behind the Courage backline. McDonald bent it around a diving Harris and to the far post for her 40th career NWSL regular season goal. The Pride came right back up the field to try to find a goal, but Courage goalkeeper Katelyn Rowland pushed aside van Egmond’s shot. A minute later, Rowland saved a shot from Sydney Leroux. The Courage controlled the possession battle in the first half 52% to 48%, but the Pride answered in the second half, winning it 62% to 38%. The Pride also won far more corners than the Courage 10-3, but couldn’t convert on them. Orlando had more chances in the second half, but couldn’t find the back of the net. Marta nearly scored an Olimpico goal in the second half, but Rowland pushed the shot off the crossbar. Morgan had a hard shot a minute later, but Rowland pushed that one off the post. Though the Pride were out of subs, Morgan was forced to leave the match in the 81st minute and the Pride finished the game with 10 players. Morgan got into several challenges with Zerboni throughout the match and appeared to leave late with a lower leg injury. On Lifetime, Dalen Cuff reported that he spoke with the Pride training staff after the match and they said that Morgan had a calf injury. Marta got another chance late, after somehow stealing the ball away from Courage midfielder Kristen Hamilton, but her left-footed shot went just wide. Marta had been working her way back from a calf strain, and Saturday was her first time playing the full 90 minutes since May 23, the last time the Pride face the Courage. She had two shots (none on goal) and four chances created. She and Zerboni finished with a game-high 78 touches. The win improves the Courage to 7-0-1 on the road and comes after a 4-1 win at Seattle last weekend. “Grabbing all those points on the road is just — in any league in the world, if you tie your away games and you win your home games, you’re in a good position, but thankfully we’ve been winning both,” Zerboni said after the game on Lifetime. Orlando came into the game on short rest, after a tough late loss to the Houston Dash on Wednesday. North Carolina hadn’t been in action since last Saturday’s trip to Seattle. The Pride came out in a 4-4-2 instead of their usual 4-3-3, packing the midfield against North Carolina’s usual 4-4-2. Alanna Kennedy and van Egmond played the central midfield spots, with Leroux and Rachel Hill on the wings. The Courage did not have Sam Mewis, questionable with right knee pain, so O’Sullivan started alongside Zerboni in the center. Krieger returned to the Pride lineup for the first time since May 26 after being out with a knee injury. Poliana slid over to the left side in place of Carson Pickett, who did not appear in the match. North Carolina welcomed Abby Dahlkemper (right knee pain) back to the lineup and Kaleigh Kurtz filled in for Jaelene Hinkle (left quad strain) at left back. Kickoff for the game was delayed by 10 minutes due to lightning in the area, but the game went on without any rain or lightning once it started. The Courage will be in action on short rest on Wednesday at home vs. the Red Stars. 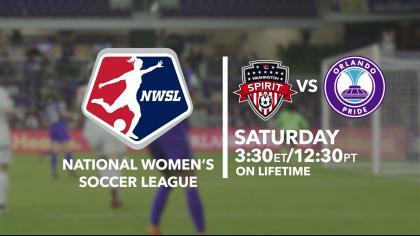 The Pride will next host the Spirit on Saturday, July 7. Match ends, Orlando Pride 0, North Carolina Courage 3. Second Half ends, Orlando Pride 0, North Carolina Courage 3. Attempt blocked. Darian Jenkins (North Carolina Courage) left footed shot from the right side of the box is blocked. Assisted by Denise O'Sullivan. Attempt blocked. Kristen Hamilton (North Carolina Courage) left footed shot from the right side of the box is blocked. Assisted by Darian Jenkins with a headed pass. Attempt missed. Marta (Orlando Pride) left footed shot from a difficult angle and long range on the left misses to the right. Offside, North Carolina Courage. Merritt Mathias tries a through ball, but Jessica McDonald is caught offside. Corner, Orlando Pride. Conceded by Merritt Mathias. Alex Morgan went off injured after Orlando Pride had used all subs. Attempt missed. Debinha (North Carolina Courage) right footed shot from outside the box is just a bit too high. Assisted by Jessica McDonald. Substitution, Orlando Pride. Kristen Edmonds replaces Ali Krieger. Attempt saved. Debinha (North Carolina Courage) right footed shot from outside the box is saved in the centre of the goal. Assisted by Crystal Dunn. Offside, North Carolina Courage. Kaleigh Kurtz tries a through ball, but Lynn Williams is caught offside. Substitution, Orlando Pride. Christine Nairn replaces Emily van Egmond. Attempt missed. Sydney Leroux (Orlando Pride) header from the centre of the box misses to the left. Assisted by Marta with a cross. Attempt missed. Lynn Williams (North Carolina Courage) right footed shot from the centre of the box is just a bit too high. Assisted by Debinha. Offside, Orlando Pride. 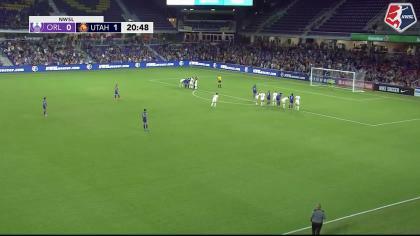 Sydney Leroux tries a through ball, but Alex Morgan is caught offside. Attempt missed. Alex Morgan (Orlando Pride) left footed shot from outside the box is high and wide to the left. Assisted by Dani Weatherholt. Attempt blocked. Emily van Egmond (Orlando Pride) right footed shot from the right side of the box is blocked. Assisted by Alex Morgan. Attempt saved. Alex Morgan (Orlando Pride) right footed shot from the right side of the box is saved in the bottom right corner. Assisted by Sydney Leroux with a cross. Corner, Orlando Pride. Conceded by Lynn Williams. Attempt blocked. Poliana (Orlando Pride) left footed shot from the right side of the box is blocked. Assisted by Marta with a cross. Corner, Orlando Pride. Conceded by Denise O'Sullivan. Corner, Orlando Pride. Conceded by Katelyn Rowland. Attempt saved. Poliana (Orlando Pride) right footed shot from outside the box is saved in the bottom left corner. Assisted by Alex Morgan. Attempt missed. Jessica McDonald (North Carolina Courage) right footed shot from the right side of the box misses to the right. Assisted by Denise O'Sullivan. Attempt missed. Debinha (North Carolina Courage) right footed shot from outside the box is high and wide to the right. Second Half begins Orlando Pride 0, North Carolina Courage 3. Substitution, Orlando Pride. Dani Weatherholt replaces Rachel Hill. First Half ends, Orlando Pride 0, North Carolina Courage 3. Corner, Orlando Pride. Conceded by Kaleigh Kurtz. Attempt missed. Alanna Kennedy (Orlando Pride) header from the centre of the box misses to the left. Assisted by Emily van Egmond. Attempt saved. Emily van Egmond (Orlando Pride) right footed shot from outside the box is saved in the bottom right corner. Assisted by Sydney Leroux. Goal! Orlando Pride 0, North Carolina Courage 3. Jessica McDonald (North Carolina Courage) right footed shot from the centre of the box to the top right corner. Assisted by Crystal Dunn. Goal! Orlando Pride 0, North Carolina Courage 2. Merritt Mathias (North Carolina Courage) right footed shot from the right side of the box to the bottom right corner. Assisted by Debinha. Goal! Orlando Pride 0, North Carolina Courage 1. Debinha (North Carolina Courage) right footed shot from the centre of the box to the centre of the goal. Corner, North Carolina Courage. Conceded by Sydney Leroux. Offside, Orlando Pride. Emily van Egmond tries a through ball, but Rachel Hill is caught offside. Attempt saved. Crystal Dunn (North Carolina Courage) left footed shot from outside the box is saved in the centre of the goal. Assisted by Merritt Mathias. Attempt saved. Shelina Zadorsky (Orlando Pride) left footed shot from outside the box is saved in the centre of the goal. Assisted by Alanna Kennedy. Corner, Orlando Pride. Conceded by Abby Erceg. Attempt blocked. Alex Morgan (Orlando Pride) right footed shot from outside the box is blocked. Assisted by Marta. Offside, North Carolina Courage. Lynn Williams tries a through ball, but Debinha is caught offside. Hand ball by Abby Erceg (North Carolina Courage). Attempt saved. 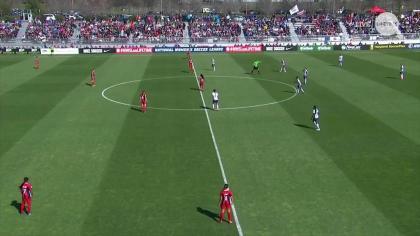 Crystal Dunn (North Carolina Courage) right footed shot from the centre of the box is saved in the bottom right corner. Assisted by Jessica McDonald with a headed pass. Corner, North Carolina Courage. Conceded by Mônica. Attempt blocked. Merritt Mathias (North Carolina Courage) right footed shot from outside the box is blocked. Attempt missed. Jessica McDonald (North Carolina Courage) right footed shot from a difficult angle on the left is close, but misses the top right corner. Assisted by Crystal Dunn with a through ball. Attempt blocked. Alex Morgan (Orlando Pride) left footed shot from outside the box is blocked. Assisted by Sydney Leroux. Corner, North Carolina Courage. Conceded by Alanna Kennedy. Attempt saved. Debinha (North Carolina Courage) right footed shot from outside the box is saved in the centre of the goal.